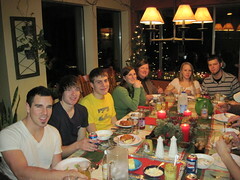 OK, I'm a little late on the post, but last weekend we had the Christmas Eide bash in Southworth. In addition to the now 16 members of the clan, Jenny's sister and husband and son also joined us before going back to Georgia. That made 19 in the house for two nights! Surprisingly, we all fit without too much inconvenience. Jill (Jenny's sister) and Marcus (that's with a c and talks with a southern drawl) took some pictures of the whole clan. We had planned some beach shots, but the weather was awful and we had to settle for inside shots. I'll post one when I get them. We had a great time. Marti provided a variation of the white elephant game that was a lot of fun. Special this year was the presence of Ada and Jackson. The two babies received large amounts of adult attention. I'm sure that they had to recoup this week. Life has almost gotten back to it's routine here in Southworth; Calvin will leave tomorrow for Trinity, leaving the empty nesters to push feathers around and take long winter naps.